The New Orleans Pelicans look like ants on the floor of the giant Louisiana Superdome during a game with the Iowa Oaks May 13|! !| 1977. At one time, the Triple-A baseball team formerly known as the New Orleans Zephyrs was a farm club of the Houston Astros. When an announcement of the affiliation was first made, a joke around town was that the local team would be renamed the Half-Astros. I winced, not just because of the joke but because of the symbolic implications. I suffer from a malady common to many American males and that is to frequently think of life in terms of baseball metaphors. (This article is now rounding first base.) 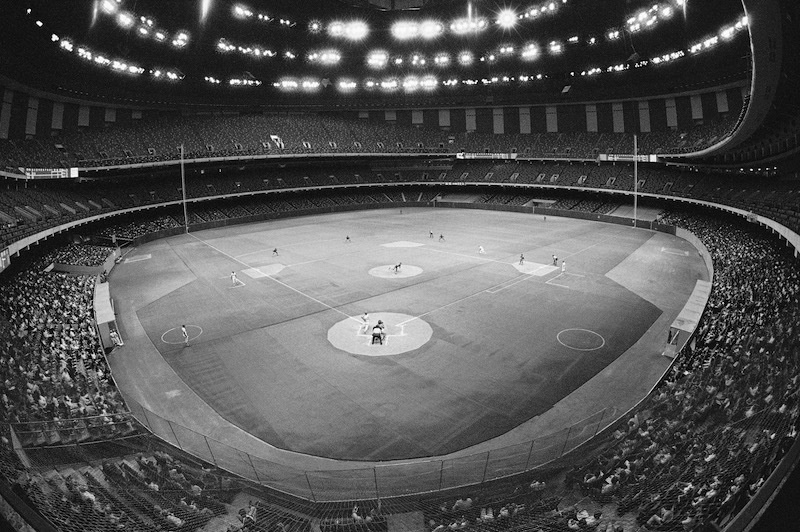 The notion of New Orleans being a farm club for Houston was loaded with disheartening symbolism such as oil jobs lost to Texas leaving us out at home plate. New Orleans was eventually replaced by the burg of Round Rock (near Austin) for the Astros' affections. In recent seasons, the local team has been a farm club for the Miami Marlins. Somehow, that seems less threatening – more like being hit by a beach ball rather than a hard ball. No affiliation has had the same panache as in the heyday of the old New Orleans Pelicans baseball team, which was a farm team for the New York Yankees. In those years Babe Ruth and company would swing by New Orleans for an exhibition game after closing spring training in Florida. Baseball, the most tradition-bound and the most senior of professional sports in this country, still reflects changes in the nation. It was the first sport to integrate by race; the first to expand to the West Coast and into the south; the first to play on artificial grass inside a domed stadium. When the Yankees came, the games were at Pelican stadium located on S. Carrollton Avenue between Tulane Avenue and the railroad tracks. Now our local team (renamed – and I still can’t get used to this – the “Baby Cakes”) plays at Zephyr Field located between Airline Boulevard (which becomes Tulane when it crosses into the city) and the same railroad tracks. The geography of local baseball remains along the same parallel, but like the nation, it has just moved further into the suburbs. • Abner Powell was both a pitcher and manager for the New Orleans Pelicans in the late 1880s. He also became an organizer, promoter, financier and most of all an idea guy. Concerned that not enough women were coming to the games, he introduced the first ever Ladies' Days at which women were admitted free. • Then there was the weather. In semitropical New Orleans rain was often a factor. Powell worried that would-be fans were staying away for fear that their money would be wasted if rain stopped a game, so he had an idea: He put wording on the ticket stub explaining that if the game was canceled because of weather, the stub would be redeemable for a free ticket to another game. Thus was created the "rain check," a term that now transcends baseball and is part of the language. Currently, the Baby Cakes are in third place in the league’s American Southern division, having completed a weekend series with that old nemesis, Round Rock. Since the writing of this blog is now rounding third base, here might be the place to mention that the game at the Triple-A level is not really about the pennant race but about the personal drama of young men trying to make it to the top. Watching the drama while holding a cold beer in one hand and a hot dog in another could be a relaxing way to spend a balmy summer night. And if the sky creates it own drama – there is always the rain check. "Krewe: The Early New Orleans Carnival – Comus to Zulu," by Errol Laborde is available at all area bookstores. Books can also be ordered via e-mail at gdkrewe@aol.com or 504-895-2266.